Called a friend, who I’ll call Floyd, and told him “Remember how good we did last year?”….helllloooo”…I get an answer something like “I can’t remember WTH I ate for breakfast this morning and you’re asking me to remember something that happened 368 days ago? I said, “try 365”! Ok whatever…..
Floyd asks, What do I need to bring? I said 2 crankin rods & a trick worm rig. I’ll meet you at the ramp at 7AM. It’s a date. We’re now in the boat. Hey Floyd could you hold my coffee while we bounce across the lake? Good ol MD’s coffee….unopened….hot…. Bringing the boat off plane, I look at Floyd and see half his white shirt is colored brown. It was my coffee….unopened….lid still on…. FLOYD – is that a new fashion statement you’re making wearing a 2 tone shirt?… censored comments from Floyd. I’ve got a lipless crankbait tied on & suggest to Floyd to throw different color toward a specific area. In minutes I hook up with a, what appeared to be a Trophy Catch qualifier, 8 lb plus behemoth that jumped twice & the 2nd time the lure came flying back towards me. Keeping my composure….you’re not believing this are you? I went nuts….Mike Iaconelli all the way….I sat down….took the hooks off the bait & installed some new KVD #2 trebles. Yeah those’ll work, I thought. Floyd ponders then starts telling me that I was holding the rod too high….put the new hooks on backwards….& I needed a colonoscopy. 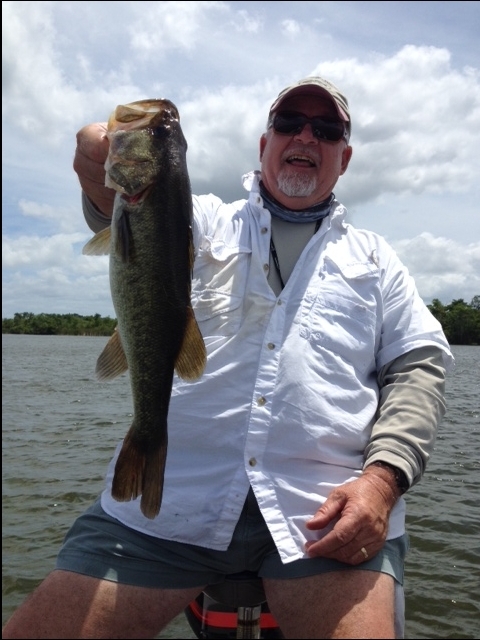 I grabbed the rod & made a few casts when, as in the words of Bassmaster Classic Champion Chris Lane, POW….there’s another good fish. I said check this ….S.O.B.M.F.F.M.H.P.O.S. @#$%^&*….But I kept my composure. New hooks on lure, a wimpy rod that has a forgiving blank so not to rip the hooks out….but then there’s the threat that these fish like to go vertical. Floyd starts all over on me….why do I subject myself to such verbal abuse??? Just 2 ol farts having a good time enjoying what they love to do in Gods great outdoors. Here’s Floyd with his ONE legal keeper. Oh yeah the score was Me 12 – Floyd 1.